FİGES, one of the crucial engineering companies having a depth of field in Turkey, introduced its high- tech products developed 100% domestically as a result of R&D studies and produced in its factory was launched in February, to local and foreign exhibitors for the first time at IDEF 2017 Fair. These high technology products are MAST, 3D Metal Sintering Systems, Bionic Hand and Impedance Tube. The devices, known as three-dimensional printers and mainly processing parts made of plastic, plastic derivatives and organic materials, have become widely available all over the world. These new generation 3D printers, having also simple models that produce prototype parts, now exist in almost every home as a result of reduced costs. 3D Metal Sintering Systems having much more advanced technology than plastic printers are able to combine layer by layer all kinds of metal powders that can be sintered, especially titanium, gold, nickel super alloys, stainless steel, aluminum, tool steels through advanced laser features and sensitive optical subsystems, and are able to produce the functional parts with high precision, which are difficult or even impossible to produce with the usual production methods of geometry. Thanks to their popularity and widespread use of these systems, the functional use of materials such as titanium, which are both difficult and costly to manufacture by conventional manufacturing methods and which are lighter and more durable, is expected to enhance in Satellites, Unmanned Aerial Vehicles and Fighter Aircraft platforms. FİGES, proceeding to serial production phase from the prototype phase, can produce any kind of 3D Metal Sintering System as per the customer’s requirements. With this new generation Metal Sintering System that provides considerable flexibility in terms of time according to conventional production methods, a critical part which is produced in one week by mold method can be produced in in 5-6 hours by this system. The most prominent factors that stand out and that distinguishes the system from other 3D plastic printers is that it can also produce non-prototype functional parts, which can also be used functionally on aircrafts or other platforms. The Metal Sintering Systems (Additive Manufacturing Systems), which were determined as a critical technology by TÜBİTAK in 2014 (FİGES was also supported by TÜBİTAK for the development of this technology), initiated to be serially produced by FİGES in its factory that has been in operation in Ankara Organized Industrial Zone since February 2017. In 2017, the factory launched to produce with 3 devices in 2 different categories and in 2018 it will produce with 5 different devices in 3 different categories. The Additive Manufacturing Systems, fitted out laser systems that can only be produced by merely limited developed countries, will thus be indigenously designed and serially produced by Turkish engineers. At the IDEF 2017 exhibition, FİGES also unveiled the Telescopic Elevation Systems (MAST) product family from 3 meters up to 15 meters in length and carrying capacities, which are made up of carbon fiber, aluminum and various composite components in various categories. 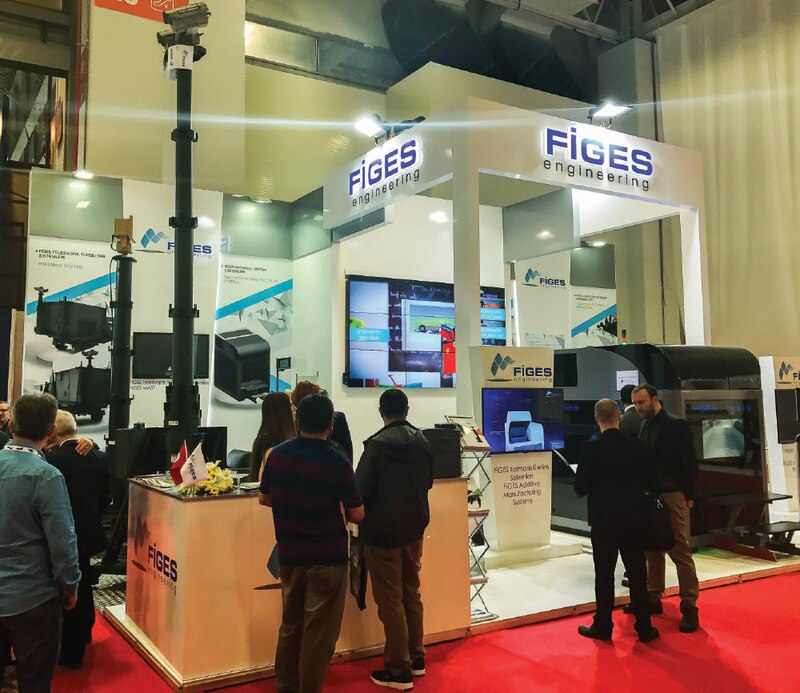 Two different configurations of Telescopic Elevation Systems (3 meters and 8 meters) developed by FİGES in a short period of 8 months were exhibited for the first time in the exhibition. These systems, which can be integrated on all kinds of land maritime vehicles and fixed platforms, as well as antennas, sensors and radar systems, target acquisition devices, communication, reconnaissance and surveillance systems and weapon systems in defense industry, can also be designed for the needs of civil communication companies. The high-strength telescopic elevation systems expected to proceed to the mass production phase in near future from the prototype phase are designed to perform in the most severe and challenging environmental conditions in strong wind, very hot and cold climates while the systems are analyzed by computer simulations and tested as per the military standards. The Telescopic Elevation Systems developed in a short period of 8 months with FİGES’ 28 years of engineering experience are mostly used electro-mechanically. While the electronic control panel of this system is also developed by FİGES, the operator can easily issue the system elevation and lowering commands via the panel. In addition, the height info can be transmitted digitally to the operator over the panel. The system having carbon fiber pipes made up of composite winding method is also protected by a patented locking system which is specially developed by FİGES. The 3-meter configuration weighing 80 kg operating at 10 degrees of inclination is able to carry 150 kg of payload while the 8-meter configuration with a weight of 120 kg can carry 200 kg of payload. Aselsan REHIS group has placed many orders for the 8-meter configuration to be used in the Self-Propelled Air Defense Gun System (KORKUT) project, the mass production of which was recently started, while the Aselsan SST group has ordered the 3-meter configuration for use in the ADOP project. It was also noted that the negotiations for a significant amount of order regarding the 15-meter configuration were made with Aselsan MGEO group throughout the Fair. The tests of the Telescopic Elevation Systems are planned to be completed in June, but according to preliminary test results made with Aselsan, the systems achieved the required performance. Following the completion of the tests, the serial production is planned for the ordered systems relatively quickly. It was also reported that the studies on the use of weapon turret systems integrated on Telescopic Elevation Systems in the future especially in the borderline are resuming. 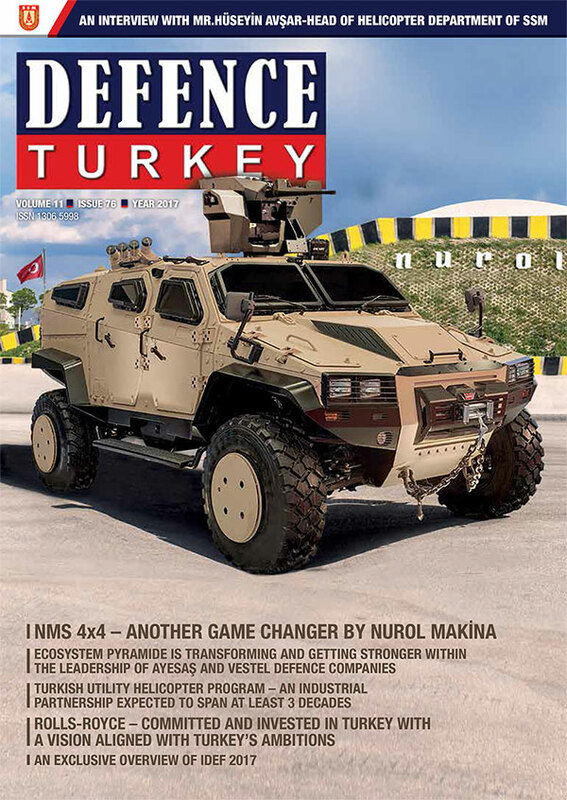 The Telescopic Elevation System was also exhibited for the first time at the IDEF Fair on Nurol Makina’s armored vehicle Ejder Yalçın. The other innovative product introduced by FİGES throughout the Fair was Bionic Hand. Developed by FİGES engineers, the bionic hand in the intelligent prosthesis class is able to give the patient a feeling of touch with the sensation of temperature and pressure. The bionic hand, which can be removed when requested, can process the signals from the brain and perform commands easily. The product, the patient experiments of which were finalized, is aimed to be marketed as a product at the end of 2017. According to the information given by the company officials, the studies on bionic foot are aimed to be started at the next stage.